I want to thank all of you for your dedicated support during our recent campaign. We made many new friends. We shall live to fight another day. More than a change of policy, this requires a change of attitude that will put residents and citizens first, especially in decisions impacting the place they live or work. Our elected officials work for the citizens, not the developers, not the staff. As a private citizen, I will continue to work to ensure greater transparency in the decision-making process, consistent with Open Meeting and Sunshine laws, to include General Policy meetings, which are not televised, and one-on-one Commissioner meetings with Charter officers. The Commission needs to set a tone in public meetings that welcomes public comment before motions are put on the floor and Commissioners "telegraph" how they will vote. 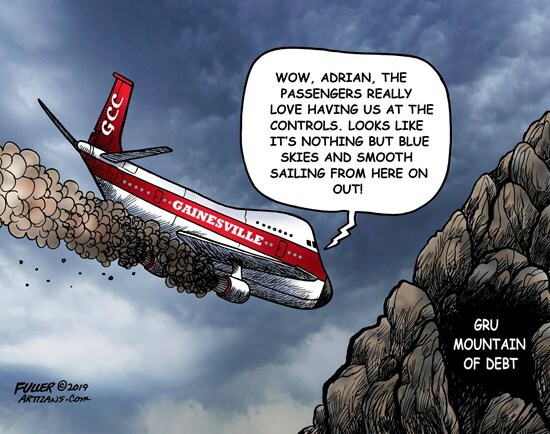 The Gainesville Sun recently acknowledged that GRU reserves are being rapidly depleted and that the GRU transfer must be reduced. This leaves the City with only three options: raise taxes, raise utility rates, or cut services. We are in this predicament because of the two incumbents' 2017 decision to acquire the biomass plant. In my recent campaign, I asked voters to hold the incumbents running for reelection accountable. However, the voters decided to reelect the incumbents and the chances of anyone being held "accountable" are slight. The Gainesville Sun recently recognized that development decisions must be carried out in a way that protects the essential character of our historic neighborhoods. While my former opponent has long promised this, he backed the GNV R.I.S.E. high-density infill plan sold to the public as a way to incentivize "affordable housing" (nearly to the end). Many of you knew it would destroy neighborhoods and benefit developers. Seeking a “vibrant” downtown, he proposed an outdoor amphitheater at Depot Park (and backed off again in the face of opposition). He also tried to eliminate limits on the frequency of loud, amplified music events that will make life miserable for nearby residents (then seeing massive opposition, backed off again and moved to"vote it down" and revamp the entire ordinance when challenged). Last fall, I helped stop GNV R.I.S.E and pledged to work with all stakeholders to develop a serious comprehensive plan for affordable housing. I still firmly oppose making downtown Gainesville a full-blown party center at residents' expense. Although the incumbents have been returned to office, we all have reason to be extremely concerned that the city will not be able to afford new spending, even to raise employee pay, or to incur more debt without serious consequences. I have over 45 years of public service to my state and country and have spent much of the past five years back home in Gainesville heavily engaged in public policy as an "active citizen". I will continue to stay engaged. Visit the "Issues" section to see the positive impact my common sense writings have made. question from Mr. Skop during a televised Utility Advisory Board (“UAB”) meeting; the inconsistencies contained within the GRU management discussion of the Fitch downgrade; and the potential adverse financial impact of the Fitch downgrade on GRU customers. Gainesville City Commission is expected to vote to approve the 2019 Series C bond issuance during the regular City Commission meeting on March 21, 2019. As of the date of this press release, the City of Gainesville has not posted the Agenda for the City Commission meeting on March 21, 2019. Fitch downgrade, GRU is kicking the growing can of debt further down the road at great total borrowing cost to GRU customers. The proposed 2019 Series C debt refinancing scheme (in the wake of the 2012 debt restructuring scheme used to hide the true rate impact of the biomass contract) is another bad deal for GRU customers. “Taking GRU even deeper into debt to fund the General Fund Transfer (“GFT”) is fiscally irresponsible”, said Mr. Skop. If the GFT is reduced as proposed by GRU, there is absolutely no reason whatsoever to take GRU even deeper into debt as evidenced by the Fitch downgrade of GRU related debt due to very high leverage. GRU customers should oppose this ill-advised debt restructuring scheme which is coming before the Gainesville City Commission for approval on March 21, 2019.
weakness for the utility. As of fiscal-end 2018, GRU had about $1.6 billion of total debt outstanding and $93 million of outstanding commercial paper. A portion of the 2019 bond proceeds will be used to repay outstanding CP with long term debt, leaving total debt outstanding relatively unchanged. knowledge of the Fitch downgrade. omission made by GRU management (Bielarski, Resnick). DOWNGRADE”. GRU management, however, attributes the downgrade to a change in Fitch rating criteria. PFM, despite two public records requests, could not provide the name of the utility to support their assertion. Accordingly, the GRU explanation of the downgrade is NOT supported by the content of the Fitch report. attached herein as Exhibit A to fact check this inconsistency and determine whether Fitch agrees with Mr.
opposed to GRU being taken even deeper into debt despite already being very highly leveraged. discussion noting that S&P and Moody’s affirmed 2019 Series A and 2019 Series B bond issuance. The KEY difference not mentioned by GRU management, however, is that Fitch actually rated the 2019 Series A, 2019 Series B, and the 2019 Series C bonds (assigning the same ‘A+’ ratings as the downgraded GRU debt) while S&P and Moody’s did NOT rate the proposed 2019 Series C bond issuance. our municipal utility at the hands of the City politicians”. Truly enjoyed this one-hour interview this past Monday evening with well-known local radio host, Fred Sowder. Gainesville is fortunate to have many talented people who seek local office. Robert Mounts, currently a candidate in District 4, is one such person. Robert has had an extraordinary professional career that speaks to his leadership and integrity, serving more than 25 years in the Air Force as a judge advocate. For two years he took leave to work for Gov. Reubin Askew, as deputy general counsel. One of the great governors in the 20th century, Askew campaigned to end corruption in government and in the courts. After working with Askew, Robert returned to national service and was subsequently awarded the Army’s highest medal for his 18 years of civilian work in South Korea. Robert has led a life devoted to public service and defense of our nation. He embraces Thomas Jefferson’s belief in the wisdom of voters. I ask you to elect Robert Mounts to the City Commission. Draft Special to the Sun: City Commission Candidate Robert Mounts Rebuts Sun Endorsement of Opponent (which Nathan Crabbe now refuses to publish). Sadly, the Sun continues to get it wrong. In its editorial Sunday, March 3, 2019, the “Editorial Board” endorsed my opponent. Yet when I appeared for an interview by the “Editorial Board” on February 19, 2019, the interview was solely about 20 minutes with Editorial Page Editor Nathan Crabbe, not the full Editorial Board. I never was offered a chance to talk with the publisher, James Doughton, the Editor and General Manager, Douglas Ray, the former Editorial Page Editor, Ron Cunningham, or James Lawrence, the stalwart proponent of GNV4All, who have participated in past screenings. I would like to have had that opportunity to look each one in the eye and make my case. Sadly, Nathan Crabbe’s endorsement concentrates on issues where my opponent and I agree, such as the “zero waste” initiative and “renters rights”. It goes “off the rails” when it endorses my opponent’s advocacy for decriminalization of use and possession of small amounts of marijuana; just ask the State Attorney. We both support decriminalization; the difference is that my opponent wants the State Attorney to do so immediately, without appropriate changes in the law. It is not a City Commissioner’s job to run the State Attorney’s office, as they must “faithfully execute” the law as it is. Even so, State Attorney Bill Cervone and Public Defender Stacy Scott have worked well together to ensure lives are not ruined by criminal convictions for use and possession of small amounts of marijuana. I applaud that. Then Crabbe misrepresents my record on affordable housing, claiming I failed to “recognize the need to expand the availability of affordable housing throughout Gainesville”. Yet from the beginning of the fight against the “GNV R.I.S.E” high-density infill plan which hundreds of my neighbors successfully opposed, I said I wanted to be part of a real solution for affordable housing. I made good on that pledge when as Chair, College Park University Heights Redevelopment Advisory Board (one of the four CRA districts), I urged the joint City-County Commissions to approve Commissioner Ward’s proposal to merge the four CRA districts, as that would allow us to shift funds from the west side where it is not needed, to the east side, where it is needed. I said some funds generated should be used as “seed money” to jumpstart a Community Land Trust that would actually build affordable housing, as done in Winter Park. Lastly, despite candid admissions that GRU is heavily in debt ($1.6 billion, of which about $658 million is due to the purchase of the biomass plant, per Andrew Caplan article in the Sun), and that GRU is proposing a tax increase, higher utility rates, and reductions in the GRU transfer, just to service the debt, Crabbe claims I was wrong to say this was caused by the purchase of the biomass plant. Tell that to the ratepayers; tell that to the taxpayers who now must suffer the consequences of years of mismanagement. Visit robertmounts.com to find out why. Here is a link to the February 25, 2019 League of Women Voters Candidate Forum Facebook video for the District 4 City Commissioner race.